Cupcakes 'n Daisies: Itsy Bitsy Swoon Block . . . . .
Itsy Bitsy Swoon Block . . . . . So after I blogged about my Baby Swoon wall hanging, for my Baby Girl's office, I kept thinking and wondering what an itsy bitsy Swoon block would look like. Then I remembered my Baby Girl also asking for a mug rug, what a perfect opportunity, I could make an itsy bitsy Swoon block and see what I thought of the downsized block and then use the block to make a matching mug rug for my daughter. So here's the smallest Swoon block I could make, based on the smallest flying geese unit I could make using my Fit to be Geese ruler. The block finished at 6 3/4". 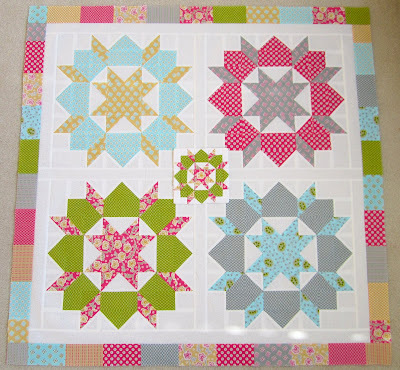 To give you an idea of size, here is itsy bitsy Swoon block in the middle of the Baby Swoon block. Here it is surrounded by Baby Swoon blocks. I have to say I think this block looks better bigger, it makes an OK smaller block but I think the bigger blocks are stunning, make a bigger impression. So I guess I would have to say, in this case, size does matter, and when it comes to Swoon blocks, the bigger the better! oh I think the block is adorable little! what a cute mug rug! I love love love the tiny block and I am really want to try to make one! I feel happier today just seeing your sweet swoon! 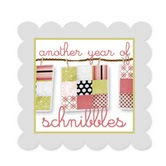 Oh my goodness - how cute is that teeny Swoon block! I love how this quilt turned out and I'm sure Ashley will love it, too. Oh my goodness...so sweet and love how you show the size in comparison to the larger blocks. Well done! There's a lot of work in the tiny block, but is cute for a mug rug. I love the bigger block and the pattern. Both big and little are lovely in their own ways! Fun to see the difference! oh my - cannot even believe this!! Fantastic swoons!! Wow! Itsy Bitsy Swoon is SO tiny! I really like it, and your Baby Swoon wall hanging is adorable. Your daughter is a lucky lady! Very cute and tiny! I love the color combination! The baby swoon looks lovely in the middle of Baby Swoon!! I love Swoon and yours is gorgeous! And the tiny one, well, that's just adorable. You did a great job with your mini block! One trick to make mini blocks as impressive as the full size ones is to adjust the scale of the fabric to match. Bigger prints can make the piecing look choppy when the pieces are small. Your baby's quilt and mug rug are both wonderful! 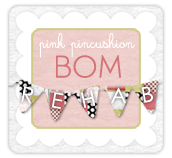 Thelma, I am so behind in my blog reading and commenting but your Baby Swoon is beautiful! The teeny one is adorable, but you're right, the larger blocks make a bigger impact. They are gorgeous! Love your mini block! I think you should make a block with the mini in the middle, it looks really cool! Wow, that's so clever and cute! Amazing!!! How did you reduce it? The block is adorable! I don't know how you figure out how to size blocks down but it the cutest thing ever! I'm sorry but Camille's Swoon pattern is covered by copyright laws that prevent me from posting my measurements. It's Birdseye Time . . .
Quilt-y-ness . . . .
My Swoon Song . . . .
Hello . . . Yes it's me . . .
Swooning Over Swoon . . . . Done Pick'n . . . . .